You know that git add adds files to index. But did do you know that it can add specific lines of files? Or even add files, ignoring their contents? Let’s check this out! First let’s get familiar with git add --patch command or it’s shorthand git add -p. What does it do? Let’s imagine that you’ve been working on some task. During the process you’ve got carried away and introduced some changes not related to your current task. Now it’s time to commit the changes, but some of them are irrelevant. It would be wrong to put everything in that commit. This is where git add --patch comes into play. But now we are a bit concerned about the second couplet and want to commit only the first part. There are some more options, you can see them by choosing the ? option. Here we want only the first part about the sugar and sweetness, so we choose the option s.
And we don’t want to stage this one, so we choose n.
Great, let’s see what we have now. Cool beans, time to commit this thing. 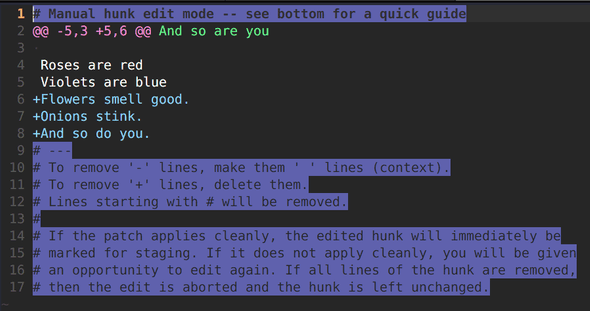 ➜  git_add_patch (master) ✗ git commit -m "Complete the first couplet"
Git splits hunks by the empty lines, but what if you really need to stage only specific lines. And you are really concerned about that onion part, but you don’t want to remove it. So you want to stage only the “Flowers smell good” and “And so do you” lines. Now the s option won’t help us, because those lines aren’t separated by empty lines, and git considers them as one hunk. e option to the rescue. It will open the default text editor and you’ll be able to manually edit that hunk. Nice, now you can decide what to do about those stinky onions later. But what if you need to add some specific lines from the new file? Use git add --intent-to-add or git add -N to add specific file, but not its contents. Imagine that we had our poem written from scratch. Now git diff shows nothing, and if we’ll use git add -p it will say No changes. No problem, let’s tell git that the file exists. Now we can use git add -p and then edit the hunk to remove the lines about onions.